Additional non-well test locations can be designated using the Locations tab of the Predict window. These can be used to test and compare low frequency models and lithofluid probabilities away from your wells. In the Locations tab, click the Add Row icon (+) to add one or more locations. Select the Survey for the coordinates from the drop down box. Type the specific inline and crossline of the location at IL and CL respectively. At the Override Water Bottom section, check the box to specify water bottom information for this location. Select to use a Constant or a Horizon to define the water bottom. If a horizon is chosen, you can optionally input a constant value to offset the horizon. 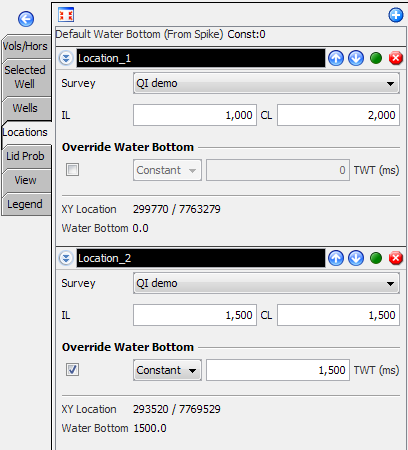 The XY Location and Water Bottom depth for the location will be displayed below. Click the green circle to disable the location. The green circle will turn amber. Similarly, if the location is disabled, click the amber circle to enable the location. The amber circle will turn green. The locations can be rearranged by clicking the Up and Down arrow keys beside the location name.